Spacious Rural Villa, Peaceful, Mountain views and Close to the Sea and Beach. The house is a typical Stazzu Gallurese, a traditional rustic northern Sardinian farmhouse, about 100 years old. It is a simple, charming and comfortable detached property set in tranquil countryside; renovated with central heating and 3 large double bedrooms, a big living room, a cosy well-equipped kitchen and 2 bathrooms. It can sleep 8 - 10 people. There is a large patio, a small vineyard, fruit trees, olives and giant cacti. Li Reni is a peaceful retreat with great views and yet within a few minutes you can be dining in town or relaxing on the beach and the nearest is about a 10 minutes (5 km) drive from the house. The farmhouse is tranquil with mountains on three sides with the sea sparkling in the distance. The local village of Viddalba has restaurants, bars, shops, supermarkets and a famous thermal Spa. Good mobile Internet. Nearby, there are beach activities: sailing, windsurfing, scuba, diving. Close by there is horse riding, trekking, canoeing, cycling, fishing and an excellent ice cream parlour! Family and house: We are an English family and Li Reni is our holiday home. I am a homeopath and run a complementary medicine centre, the Highgate Health Centre, in Highgate Village, London. My partner is a podiatrist. We have children at college and some actually even working. We all enjoy coming to Sardinia whenever we can. The house is a simple, delightful and tranquil rustic retreat. Sitting on the patio enjoying a glass or two of local wine all you can hear are the tinkling bells of sheep and goats as they graze in the surrounding mountains. We are slowly trying to make the house more self sufficient. We have our own waste treatment and the water can be used for the garden. We hope soon to have solar power and our own well for fresh water. Our little vineyard and fruit trees are organic. Li Reni is a traditional Northern Sardinian farmhouse, called a Stazzu Gallurese and was one of the first properties to be built in the entire area. It is an important building locally as there are few original Stazzu left and it is the equivalent of Grade II listed. It was until recently a working farm. We have renovated most of the property, added a modern new bathroom with a good shower, modernised an older bathroom which has a bath, shower and washing machine and we have created a cosy kitchen with local granite worktops, a new oven and fridge/freezer. I hope you might enjoy what we love about Sardinia, the fantastic beaches, beautiful countryside with empty roads and excellent food. Sardinia is famous throughout Italy for the purity and integrity of its food and much of what is produced locally is organic. The inland towns are fascinating, often set on the sides of mountains with spectacular views. The people are open and honest and all year round there are festas in all parts of Sardinia with music and dancing. In summer there are local festas every night and as busy a nightlife as you could want. Nonetheless, the house remains a peaceful haven. There are some good expeditions to be had into the mountainous interior of the country and along the coast there is beach after beach to be explored, many of them quite empty even in high summer. If you need it the mobile internet, smartphones, PC Tablets, etc., work well in Li Reni. We have a caretaker who lives 5 minutes away. He is a lovely guy with a young family and will happily help you as needed. Do contact me if you are interested in renting Li Reni or you just want to know more about the house and Sardinia. There is also a pretty comprehensive visitors pack with detailed directions and if you want to know more about horseriding, trekking, diving, cycling, mountain climbing, caving, sailing, etc., please just ask. All the bedrooms are of a good size, have double beds, large wardrobes and there are 4 extra single beds that can be made up as necessary. There is a cot. The upstairs bedroom is very large with a double bed and a single bed and can accommodate additional beds. There is a large living room, 2 sofas (one of which is a sofa bed) and 2 armchairs seating 6-8 people. There is a dining table that seats 6-8. The kitchen is cosy and fully equipped and there is one bathroom with a power shower, bidet and loo and a second bathroom with a bath with shower, bidet, loo and washing machine. There is a very large patio shaded with trees, a wooden table and chairs. Li Reni ..... what a wonderful holiday. We liked the house very much and especially the place in front of it, with the garden around. I often watered the flowers and admired every single plant. We even tried a Sardinian recipe from the calendar with pine nuts, garlic and lemons from the garden - this became our favorite food. The beaches are very different and we have tested some. We like them all. Especially the one on your card, we walked over the rocks to this lovely lonely beach. Spiaggia di San Pietro became our "home" beach. Right next to it and also very exciting is the lagoon - river Coghinas. We are all very curious and so we explored the river with kayaks and SUP's - very exciting for children. We also liked the small village viddalba next to Li Reni with some cafes and a small museum. It is worth visiting the museum, which beautifully describes the history of the valley. Everything you need you can find in the supermarkets. We could not resist and bought a dessert in our favorite cafe. The dessert was unbelievably delicious. Tempio Pausana is also a nice little town, we liked a lot. We were looking for the water source and found it in a mysterious park with big trees. That is a lovely review, thank you. We came to the house just after you left and my wife said what a good energy there was in the house and how it seemed as if your family had a good time on holiday in Sardinia. It was great to hear you liked our garden, terrace and fruit trees as well as the nearby village and beeches. There is lots to do in and around the house and I am so pleased you had fun enjoying some of what the local area has to offer. Perfect getaway, it was our first time in Sardinia and the area was lovely and peaceful. The house was nice and cool inside, and rooms were spacious. The terrace had views over the countryside, the local town had useful shops, and the beach was lovely and unspoilt. Would love to go back soon. Thank you very much for your review, we are very glad you had a good holiday with us and we look forward to seeing you soon. This is the third time we have visited Li Reni and we are hooked. The farmhouse is lovely, characterful, well appointed and fitted out to make for a comfortable stay. It is quiet and peaceful with glorious views over the hills and to the sea. It is also close enough to local amenities and beauty spots. We love the private beach at Isola Rosso (half hour away) and also Castel Sardo, both of which have lovely restaurants and scenery. The region is super clean and there is a clear island pride in keeping everything unspoilt. Locals are really friendly and Viddalba, the local village has various local bars, shops etc for provisions. The weather is pretty beautiful all year round as well. Booking is efficient and easy. Airport (Olbia) is 90 mins away and journey uncomplicated. Strongly recommend Li Reni for people who value peace and quiet, simplicity and appreciate beautiful scenery and nature. Thank you for taking the time to write such a great review. It was very nice to have you back again in Li Reni. it is lovely for us that we can play a part in visitors enjoying the beautiful region and our house. We've just come home from a lovely holiday in this wonderful farmhouse near Viddalba. Pictures on booking sites are often so nice that reality can only disappoint you, but in this case the reality was even better! With 6 adults we did not need to throw the dice over the 3 wonderfully furnished bedrooms and the 2 bathrooms were also greatly appreciated. Special mention for the quality bookshelves that demand to be read and therefore ask for a longer stay. From below the trees (that have grown considerably bringing even more shadow) the view over the valley towards Castelsardo and the sea is beautiful. We certainly intend to come back here, because we have not seen all of Sardenia yet. And this characteristic farmhouse has proven to be the ideal base for further exploration. Ever wanted to stay in one of those tranquil, out of the way places travel writers write about? We stayed at Li Reni in September, still warm/hot, and it is one of those places. In the midst of the hills of northern Sardinia, yet only a few minute's drive from a number of local, picture-postcard villages, with their friendly shops, bars and restaurants, to buy supplies, or have a very reasonably priced evening out. A glass of red on the terrace as the sun sets, is the perfect segue from a day at the beach or exploring the countryside, to enjoying a dinner of local fare and Sardinian hospitality. A good choice of beaches from the busy to the secluded, or a walk along the coastline with a picnic along the way, made for some great days out. Li Reni has been beautifully restored in the old style with modern facilities and is so quiet and restful at night. It's surrounded by its own gardens of lime trees and other typical hillside plantings. Thank you so much for your review, it is really appreciated. I am so glad you enjoyed Li Reni, September is a is a really nice time to visit Sardinia and once our kids have finally left school I hope we can spend more springs and autumns enjoying ice cream and romantic coastline walks. My favourite ice cream parlour is, of course, my local one which I think is called "non solo gelato". Mine is a tough decision between limone or cioccolato but for the wife it is always pistacchio which she never needs to share with the kids or me. Clever woman! 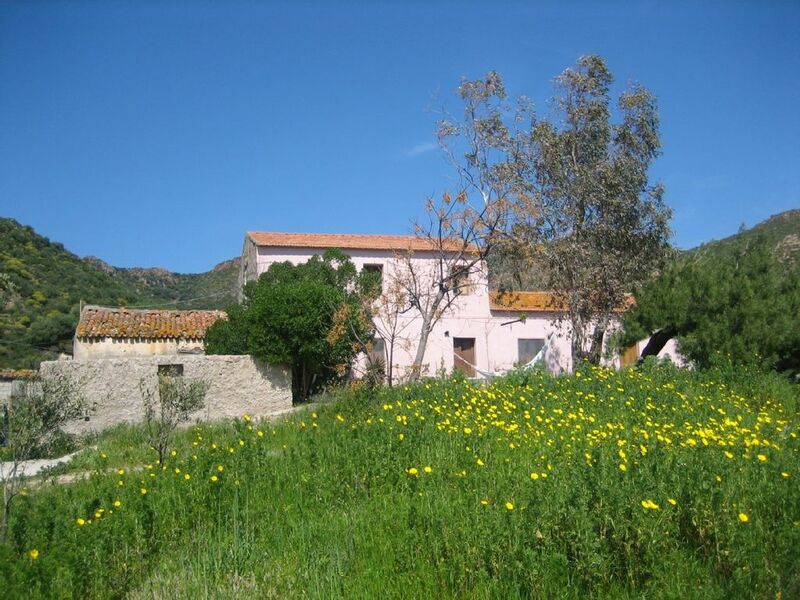 The farmhouse, Li Reni, is on the north coast of Sardinia between Costa Smeralda and Alghero. The area is famous for its stunning coastline, fabulous beaches and coves with crystal clear water. Inland Sardinia is fascinating with mountain towns and superb driving along winding empty roads where you have the most fantastic variety of scenery to explore. From the farmhouse you can just relax on the patio but you are also only a short drive to busy seaside towns, exploring the lovely coast or visiting mountain villages. Ryanair flies to Alghero (all major car hire companies are represented at the airport) and Li Reni is about an hour and a quarter's drive away. You can also fly to Olbia, Costa Smeralda, and the house is about an hour's drive. The nearest village to Li Reni is Viddalba about 5 minutes away.